If we missed anything, contact us. The Acorn theater is located at 107 Generation Drive, Three Oaks, Michigan. We are approximately 70 miles from downtown Chicago, 30 miles from South Bend and 20 miles from St. Joseph. Here are directions. The theater is in the restored featherbone factory which also houses Journeyman Distillery and Staymaker restaurant. For restaurants, accommodations and experiences in the local area, check our Tourist Information. The Acorn is in the Eastern Time Zone. However, we are only 15 miles from the border for Central Time. Because we are so close to the time zone border, phones and auto clocks may show Central Time. It can be disappointing to arrive an hour late to a show because of the time difference. Free public parking is available on the streets and in lots throughout Three Oaks. Overnight parking is not available. Please reference this map for details. No. There is no cab service. Uber and Lyft are currently not available. How do we purchase tickets? The fastest way to purchase tickets is online. You may also purchase tickets in person or by phone during box office hours. For additional questions, email us at info@acornlive.org or leave a message at 269-756-3879. All shows at The Acorn are General Admission which means most seats are first come, first served. Yes. The Acorn offers a limited number of reserved seats. To reserve a seat, make a $25 tax-deductible donation for each reserved seat. You may make your reserved-seat donation when you buy your ticket online or in-person during box office hours. All donations go to The Acorn to support ongoing operations. Thank you! Can we get on a waitlist for a SOLD OUT show? No. If a show is listed as SOLD OUT on our website, we will not be releasing more tickets. The Acorn does not keep a waitlist. What are ticket service fees? The Acorn charges a small fee to cover the cost of using a credit card. When tickets are purchased in-person at the box office using cash or check, there are no ticket service fees. Am I able to transfer my tickets to someone else? If you are giving your tickets to someone else, make sure they know the ticket holder’s first and last name for check-in. The Acorn does not hold tickets. No. All tickets are non-refundable. Can I exchange my tickets for another show? The Acorn does not allow for ticket exchanges. I have extra tickets. What do I do? The Acorn does not get involved in the resale of tickets. I lost my hard-copy tickets. What do I do? Provide your first and last name at check in and we’ll look up your record. An artist announced a show, but I don't see it on your website. How do I buy tickets? In rare instances, a performer will announce a show before it's listed on The Acorn’s website. Please join our email list and follow us on Facebook or Instagram. These are the first places we announce new shows and provide on-sale dates. For evening shows, our box office opens at 4 pm ET (3 pm CT). For other show times, box office hours vary. Check the specific event listing for box office hours. The Acorn typically opens one hour before show time. Please check the specific event listing. The door-open time and show time are also on your ticket receipt. Is there a waiting area inside The Acorn if we arrive before doors open? The Acorn does not have a waiting area inside the building. If you arrive early, you can either queue in the line or relax at one of our local bars or restaurants. How many seats does The Acorn have? Our maximum seating is 260 which includes 100 fixed auditorium seats. 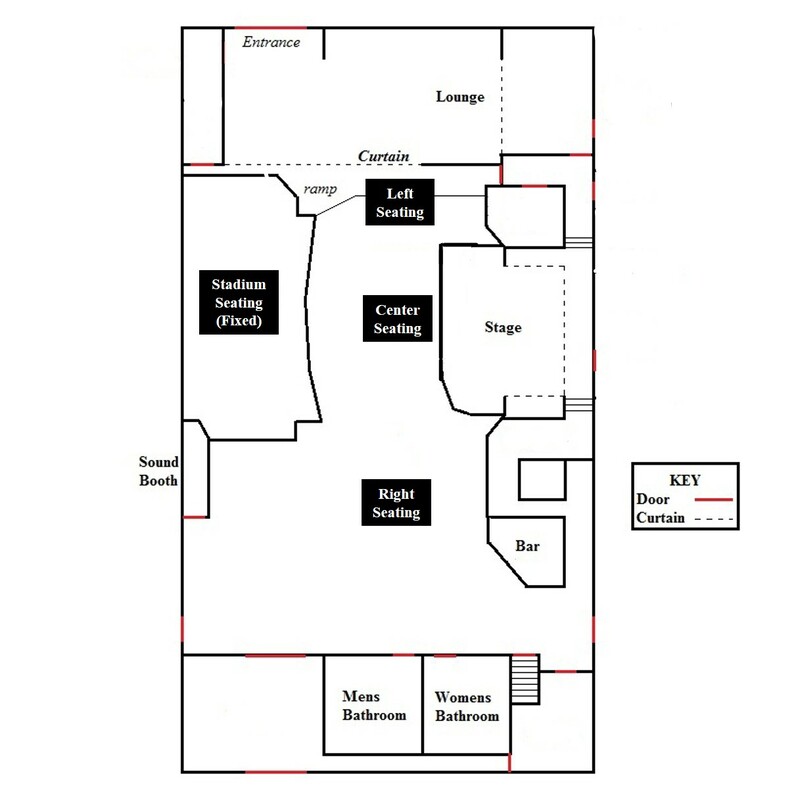 To view our seating arrangements, see our venue diagram. Check the specific event listing to find out if there is an opening act. Most shows are about two hours. Is The Acorn ADA accessible? The Acorn is fully ADA accessible. If you have special needs, please e-mail us at info@acornlive.org or call the box office at 269-756-3879. To better accommodate you, please contact us at least 48 hours in advance. No, unless noted in the specific event description. Yes. Acorn gift certificates are perfect for any celebration. To purchase, email info@acornlive.org or call 269-756-3879 during box office hours. Gift certificates are good for five years. Is photography allowed at The Acorn? Photography is allowed during most performances at The Acorn, but flash is not permitted. We request that our patrons respect the experience of others and refrain from blocking anyone’s view or recording for extended periods of time. The Acorn has a full bar with an exciting array of cocktails, an extensive beer list plus traditional bar snacks. Where can we get a drink or meal before or after a show? 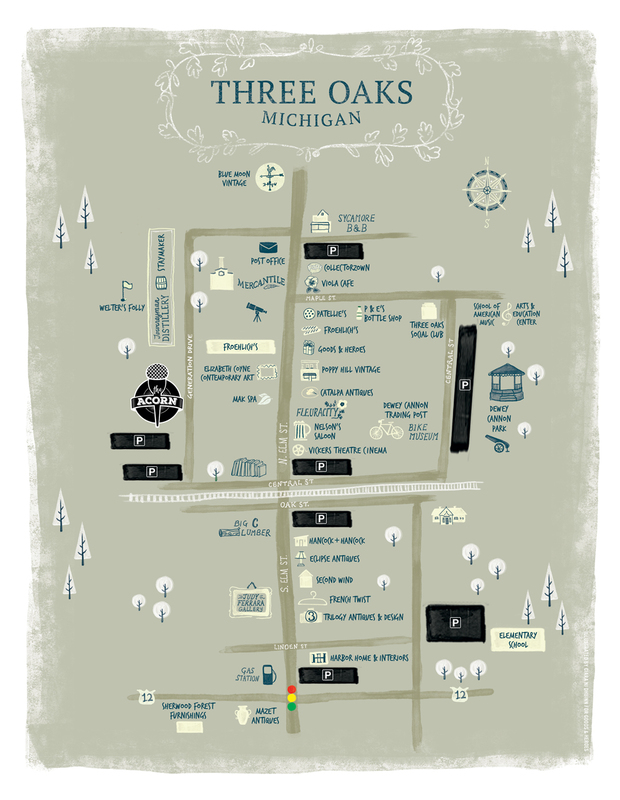 Where can we stay and what can we do when we are in the Three Oaks area? How can I find out more information about performing or producing at The Acorn? For information on booking shows, please go to our PRODUCERS page. I’d like to perform at an Open Mic. What should I do? Please contact Sandra@acornlive.org. Acorn Open Mics are curated which means that all Open Mic performers submit an audio or video recording before being scheduled for an Open Mic. Is The Acorn available for a corporate event? Please email Doreen@acornlive.org or more information. Is The Acorn available for weddings? Please email Leighanngilpin@hotmail.com for more information.